Capacities from 200 to 325lbs. 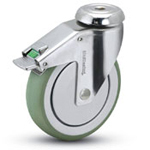 Nylon casters offering precision bearings in both our swivel raceway and wheel provide a smooth, quiet and maintenance free caster. There is a wide assortment of fittings available. Ideal for any Medical or Institutional environment where appearance and performance are critical. Colors available. 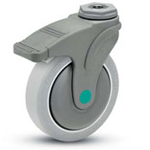 Nylon casters featuring stainless steel components go where others can't. Well suited for any application where non-magnetic casters are required. Can be used in MRI enviroments. Capacities from 190 to 240lbs. These stainless steel casters are perfect for animal cages, laboratory equipment, case carts or anywhere else you need added durability and reliability. 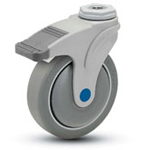 Anti-Microbial wheels are available to help fight bacterial growth. Capacities from 550 to 1000lbs. Heavy duty stainless steel casters with capacities up to 1,000 lbs fill the demanding needs of the animal caging industry. Capacities from 190 to 260lbs. 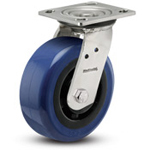 MedCaster antistatic casters and wheels can help minimize the risk of electrostatic discharge. Conform to CEN standards with resistance values < 10,000 Ohms. Zinc plated finish and sealed double ball raceways and antistatic properties make these casters ideal for care beds, medical-technical equipment and rehab apparatus. Capacities from 220 to 264lbs. 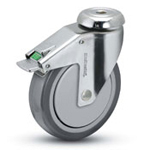 Central locking casters featuring chrome finish, precision bearings and non-marking wheels for OEM or direct replacement applications. 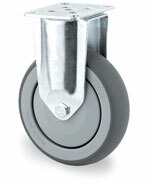 These casters are priced economically allowing you to replace in sets of 4. 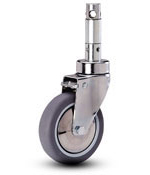 Stainless steel central locking casters offer maximum durability for any environment. Precision bearings provide smooth and silent operation. Stainless steel thread guards for added protection. Load capacity to 440 lbs. 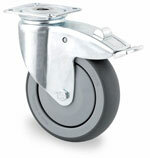 Swivel caster, housing made of pressed steel, bright zinc plated, blue passivated, double ball bearing swivel head. 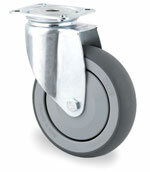 Swivel caster with total lock, trailing end of caster, housing made of pressed steel, bright zinc plated, blue passivated, double ball bearing swivel head. Load capacity to 265 lbs. Fixed caster, fork made of pressed steel, bright zinc plated, blue passivated, wheel axle with nut.